Bihu is the Assamese term for marking the onset of the harvest season or the Assamese New Year. 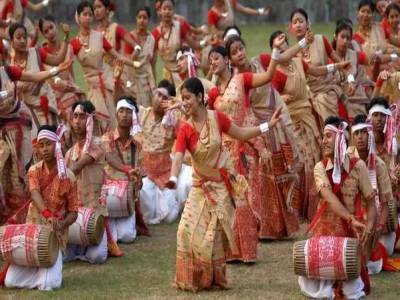 Bihu is an eagerly awaited festival and is one of the biggest festivals in Assamese culture involving a lot of indigenous display of song dance and merry making. Rice is the staple diet of the Assamese folk and hence it comes as no surprise that the harvest season includes major volumes of rice along with other cash crops in minimal volumes. Hence the delicacies and edible treats for this occasion are substantially rice based. 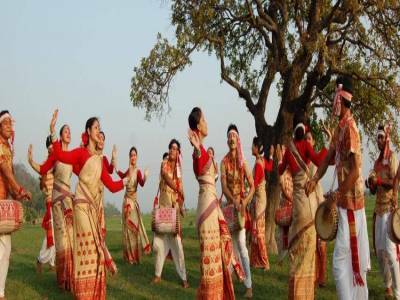 A visit to Assam during the Bihu period would be a delightful and make one privy to the best of Assamese culture displayed on a platter, including indigenous attire for men and women, dance forms and traditional food to mark the occasion. The Bihu festival is segregated into three types, namely Rongali Bihu, celebrated in April, Kongali Bihu observed in October and Bhogali Bihu celebrated in January. 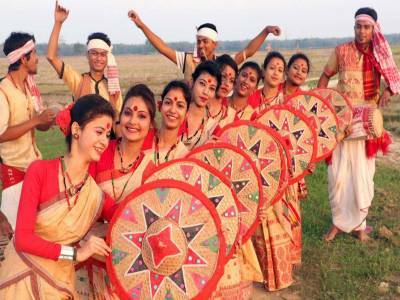 However the most significant and comparatively largest of the three Bihus is Rongali Bihu which is in reverence of the harvest season coinciding with the Assamese New Year. Rongali Bihu is the festival among the three Bihus which also implies Bihu Dance as a part of the fanfare and celebrations surrounding this event. Like the festival in itself which is in observance with fertility in soil and harvested crop, Rongali Bihu is also exploited as a fertility festival through dance forms by women trying to find suitable partners through courtship. 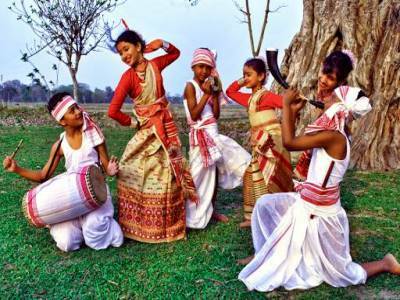 The Bihu dance involves young unmarried maidens clad in traditional attire with a white saree draped around the length of their torso and ornamented with traditional head gear and jewellery. They partake in traditional Bihu dance which has amazingly mesmerizing communication by body movements synchronized with the beats of music. The women use dance movements to bring their admirable femininity into prominence for their chosen or desired one. 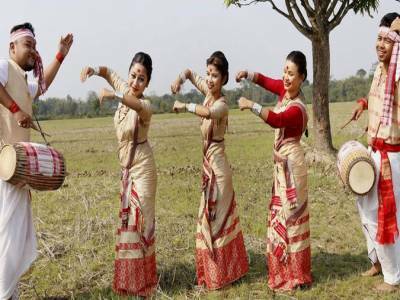 Bihu Dance involves orchestrated movement of the hips, arms, pelvis in synchronized manner to catch the undivided attention and vent their availability and interest for their loved ones. Get quick answers from travelers who visit to Bihu Folk Dance.